Houses of worship are havens from fraud, right? Wrong. The author describes how church workers’ erroneous thinking leaves them particularly vulnerable to fraud and what congregations can do to deter and prevent fraudsters’ attacks. The telephone rings, and a pastor tells me that his church’s building fund of $180,000 has no balance. I ask him if the church offerings weren’t meeting the budget, and he says that he believes that they were. It seems that the previous long-time volunteer treasurer had stepped down, and then a new member of the church decided to fill the spot. The relieved pastor was grateful. However, after several months, the building fund began to dwindle. The new treasurer said that she had to transfer monies from the building fund to the operating fund. My investigation revealed a simple scheme. The new treasurer was drawing checks from the building fund made payable to an out-of-state limited liability company. The payee on the checks was a shell construction company, and the treasurer was reverting funds via online banking back to another local bank account. Apparently, the new treasurer had a gambling problem. The church didn’t conduct a background check with the treasurer’s prior church, at which he’d committed the same scheme. The prior church had decided not to prosecute because of its embarrassment. Anti-fraud education and prevention in churches has been one of my top priorities during my 23 years in the ministry. I’ve conducted several fraud examinations ranging from a small $25,000 benevolence fund fraud to a $1.5 million denominational credit union fraud. Many believe that others wouldn’t take advantage of people in houses of worship. Of course, fraud examiners know that all organizations are vulnerable to fraud. Churches, synagogues and mosques are particularly susceptible because trust often replaces basic internal controls. And most houses of worship don’t know how to either prevent fraud or deal with it when they discover losses. Fraudsters in houses of worship commit various schemes. In the $25,000 small benevolence fund case, a church treasurer used her stolen cash to pay off personal loans and also gave some to her family. In the denominational credit union case, its manager converted customer accounts through false real estate secured interests. In a very sophisticated scheme, she removed money from customer accounts and recorded them as loans from the credit union to the customers from which she’d converted the cash. The credit union manager would exhaust the funds from the customer accounts into her bank account in another county. To cover herself with the credit committee of the board of directors, she would go to several surrounding counties and file deeds of trust proving that the loans were sufficiently collateralized by real estate. However, the real estate that she used either was already collateralized by another lending institution or didn’t have a mortgage. I’ve seen external sources such as vendors, payroll services and insurance agents defraud churches. However, most frauds are committed by trusted internal people: pastors, long-term employees and long-tenured volunteers who act as treasurers and ushers. All have some control over cash. Fraud traumatizes a congregation. Its board is reluctant to press charges with the district attorney and file an employee dishonesty bond. The embarrassed church doesn’t want media coverage because it feels others will believe it wasn’t diligent in its internal controls and oversight. The congregation and leadership feel vulnerable to its ecclesiastical authority. And, of course, donations can plummet. The pastors of churches of 700 to 2,000 members I interviewed for this article, many who have been victims of fraud, said they weren’t equipped to supervise internal controls or didn’t know how to manage financial oversight of those employees who handle business transactions. Therefore, these pastors know little about fraud schemes and how to prevent them. A house of worship is a business. Of course, most pastors, rabbis and imams have been trained in theology, counseling, pastoral care, preaching and other religious courses, and few have undergraduate degrees in business. Even small congregations have to deal with business transactions, such as collecting offerings, paying bills and financial board oversight. Larger congregations and megachurches require even more internal controls because of the heavy amount of flowing cash and business transactions. Pastors have told me they’re so busy taking care of their congregations that they don’t have the time to supervise employees or volunteers who have custodial powers over offerings and payables. Of course, church budgets are usually smaller during an economic downturn because people give less. 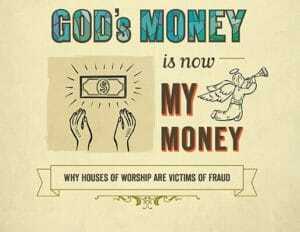 And fraudsters hit houses of worship more when the economy sours because of their own financial hardships. When pastors discover fraud, they might be embarrassed and ashamed because they believe they have the ultimate responsibility for the lack of financial oversight. Or pastors might rationalize that fraud prevention and financial management just aren’t within the scope of their jobs. Houses of worship can be easy pickings because they teach their congregations to trust others — a basic theological premise of their religions. Faithful members might think their leaders and members wouldn’t embezzle, and they’re immune from fraud because “that only happens in the secular world.” So they trust their staff members and volunteers too much, which can lead to a lack of segregation of duties and inadequate internal controls. Conversely, house of worship leaders might presume that volunteers, unlike employees, won’t perpetrate frauds. However, I’ve seen volunteers — treasurers, money counters or ushers — who insidiously infiltrate church leadership structures only so they can embezzle. When I was in the pastorate, I heartily welcomed volunteers because they’re difficult to find. Pastors have to spend valuable time contacting people to take on volunteer jobs. However, when growing churches can’t afford paid staff members, church leaders might not properly check volunteers’ backgrounds and recommendations. This can be a recipe for disaster. Two types of volunteers commit fraud. Tenured volunteers usually have been long-time members and have held positions of trust in the houses of worship, such as treasurer. Also, they try to remain above suspicion by being close friends with the pastors. They’ve had the same volunteer job for years and usually are pillars of the congregations and often in their communities. Everyone trusts them and believes that they’d never commit fraud. However, they’ve been running their schemes — whether it’s skimming, disbursement fraud, ghost vendors, payroll fraud or collection fraud — for a long time. Few review these volunteers’ transactions. Secondly, beware overzealous members. They immediately volunteer when houses of worship need to fill suddenly vacated positions, in which they’re entrusted with funds. They ride in as humble heroes to save congregations during times of need (and vulnerability). These volunteers might be lying in wait for pivotal vacancies. Sometimes, they’re new members to the congregations and communities, but they’ve impressed everybody with their fire and willingness. Fraudsters on white horses. Houses of worship that don’t properly segregate duties are vulnerable to fraud. This is especially true of smaller churches at which only one person is responsible for the finances with management of offerings, depositing monies, signing checks, payroll and disbursements. Now the best solution would be for each congregation to seek out a willing CFE to help it with its fraud prevention and deterrence! (Here’s a great opportunity for readers who attend houses of worship to volunteer your professional services.) Barring that, small- to medium-size churches should form and train lay audit committees to review transactions yearly. Many large congregations and megachurches should employ external accounting firms that specialize in churches and religious organizations to conduct independent audits or review opinions of financial statements. Lay audit committees should have no less than three members, and one member should have financial experience. No lay audit committee members should have any direct access to cash, collections or disbursements of the period under review. The audit committees should carefully review all bank statements, canceled checks, deposit slips, usher cash and check reports from Sunday collections, savings accounts, financial investments and bank reconciliations for possible embezzlement. From those reviews they can trace cash from plate offerings, pledge payments and other designated funds plus review disbursement amounts and documents, approval procedures, selecting of material transactions — both receipts and disbursements — and disbursement invoices. Other procedures could include a review of insurance coverage and transactions flowing to the general ledger and financial statements. The lay audit committee should give reports to the financial oversight board, church board, members and, if requested, to the denominational ecclesiastical authorities. Finance committees should implement procedures for segregating duties that include: supervision of the ushers’ activities; requiring two signatures on each check; assigning at least three money counters, each of whom verifies the others’ counts; plus review of vendor invoices, bank statements and the general ledger. Even houses of worship that employ independent accounting firms that conduct a financial statement audit should implement these procedures. Whatever the size of membership, a house of worship needs levels of supervision that review duties and ensure that the devised procedures are implemented. Top leaders and/or audit committees need to report their findings of implementation levels and segregation of duties performance to the finance committees and ultimately to the boards. These findings should include both paid staff and church volunteers. I’ve seen churches devastated by fraudsters who were trusted volunteers or members of the clergy. If houses of worship conduct due diligence and implement procedures to prevent and deter fraud, then it can use the money to do God’s work and not line fraudster’s pockets. A lot of information to take in , but worth the read. Great read. Copyright © 1999 - 2019 Canadian Private Investigators Resource Center - All Rights Reserved.